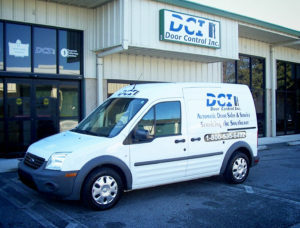 Our Company – Door Control, Inc.
DCI has expert knowledge in all aspects of automatic doors – from planning to designing entrances, to installing and maintaining the doors. We are a one-stop door-shop, eliminating the need for multiple vendors. We are always there for you – available through our toll-free number, our direct cell phone numbers or through our online portal program, DoorTrac. DCI was founded by Victor Bradberry in 1975. Victor was already operating a glass company at the time when he saw the need and opportunity for automatic doors. Our business spans nearly all of Florida and extends into Georgia. We have over 30 full-time, intensely-trained technicians on staff to more than accommodate service needs, whether in Savannah, Tallahassee or Tampa. Each technician is certified on the ANSI standards pertaining to automatic doors. This ensures that every door that DCI maintains, whether it is an ADA door or a large revolving door or anything in between, will meet the industry safety standard and thus minimize liability. We at DCI take pride in guaranteeing quality products and technical expertise to our customers.